Instructions: Mini Album is 6 1/2 x 6 1/2 x 2". Cut 2 pieces of cardboard for the covers at 6 1/2 x 6 1/2" and the spine at 6 1/2 x 2". Take 2 pieces of brown cardstock and glue them together with 1/2" overlap, then tape or glue down the covers and spine with 1/8" gaps in between them. Draw a 1" line all the way around your book and cut that out, put tape or glue on it and fold everything to the inside of your book. Cut 2 pieces of cardstock at 7 x 6" for the inside of the album and glue these down. To make the spine, cut 3 pieces of the brown cardstock at 6 x 1 3/4, 6 x 2 1/4 and 6 x 2 3/4". Now score them all 3 1/2 on both long sides, put tape on both sides of the fold now place them on top of each other. Glue the spine on your book. Now for the pages, take 6 pieces of cardstock, cut them exact at 12 x 12". Now score and fold them in half, turn the page and fold in half again. Cut 1 score line in till the center, do this with all 6 of them. Now fold them in half and then double (I will put a photo on my blog). Put glue on the bottom of the center piece now you have a sleeve, do this with all 4. Now you can place them by putting the sleeves over the hinge part, by removing the tape on both sides. Now you have 6 pages and every page has 4 pages and a pocket. To decorate the front of the album cut a designer paper 6 x 6 inch. Fussy cut a border of your choice from the same paper pad and adhere along the bottom. Take a piece of ribbon and tape this on the bottom, fold it to the back of the paper, now glue the paper on the cover. Glue the closure down, mat the photo on white cardstock and place it on the cover. Stamp and die cut the tiny flowers of the Floral Fashionista using Rich Cocoa ink, color with Summer Sky ink. Shape using coordinating mold. Stamp and die cut the medium sized peony three times with Vibrant Fuchsia ink, color with Magenta Hue and Buttercup ink. Shape using the Deluxe flower shaping mat. Stamp and die cut the Oakberry Blossom Leaves using Bamboo leaves ink. Color with Fern Green ink and shape using coordinating mold. Cover leaves in Crystal Lacquer and allow to dry. Layer and pierce the centers of the flowers as shown and insert stamens. 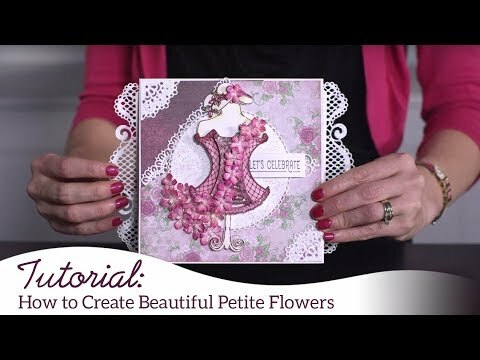 Glue the flowers on the left bottom corner of the album. Place the crown rhinestone sticker on the cover. For the back cover cut a 6 x 6" piece of patterned paper, then tape a piece of ribbon on it and put the other side of the closure on it. Take another piece of paper and cut this at 5 1/2 x 5 1/2" and glue this over the ribbon. On the page shown, cut Floral Fashionista paper to 5 3/4" x 5 3/4" and adhere on pages. Mat photo in white cardstock and adhere onto page. Stamp the Floral Fashionista flowers in Rich Cocoa ink on white cardstock and die cut. Shape using coordinating mold. Stamp Oakberry Leaves with Bamboo Leaves, color with Fern Green ink and shape using coordinating mold. Layer leaves and flowers in lower left-hand corner, inserting rhinestones in the flower center. Finish by adding stickers as desired.